Home Blog Having a Good Morning! Mornings can be a challenge and sometimes a source of stress when you are trying to get out the door at a particular time with little ones in tow. Sometimes it even feels like the days I have the earliest appointments are the days when I can guarantee my daughter will have a meltdown. Luckily there are lots of things we can do to help ease the stress of the morning routines…let’s face it, no matter what happens we still have to get out of bed, brush our teeth and carry on…we might as well make it as stress free as possible right? No matter what your morning routine looks like, there are some common parenting strategies that you are likely using. Specifically, you are probably giving your child instructions (e.g., “it is time to brush your teeth”), engaging in some role modeling (e.g., your child can see you flossing and brushing your teeth if you are doing it every day), and giving your child feedback on what they are doing (e.g., “great job putting your toothbrush away”). Although most of us are using these parenting strategies regularly, we may not be using them in the most effective manner. Here are some general tips that may help make our use of these strategies more effective with respect to our morning routines. The first thing I always recommend to the families that I work with is to identify what it is you want to see your child actually do in the morning. Out of necessity we tend to focus on what we don’t want to see. For example, I might say “I don’t want my son to take so long to get dressed when I ask him to”. Instead I should look at it from the other perspective and say “I want my son to get dressed when I ask him to”. You can even make it more specific and insert a reasonable time frame for it. For example I might say “I would like my son to get dressed within 5 minutes of being asked”. This needs to be child and family specific and is based on what works for you. The point here is to frame it in positive terms so we can start to work on getting the behavior that we want to see happening more often. Notice how this is a very plain chart. You would want to individualize this to your child’s interests. For example, there may be more colours, the font might be different, you could use pictures instead of the text as I stated earlier and you may want to include graphics to make it more interesting. Of course these types of individualizations would be better determined by you, the parent ,who knows your child the best. Each of the steps mentioned above are fairly self-explanatory and can make the difference between a child learning something like a new morning routine or not. The instructions step is simply telling the child in words what they should do. Including the chart as you are reviewing each of the steps will help provide a reference for your child. It is very important that we do not stop there. It is clear that instructions simply are never enough. The next step is showing them how it should be done. This can be done with short videos or I might demonstrate it in person (e.g., as I take out the toothpaste, this is how you brush your teeth). The next step involves letting your child practice and giving feedback on how they did. If your child did all of the steps correctly it is important to praise them immediately and to let them know what they did well. For example you might say “Wow great job doing all of the steps in the morning routine! Here is a sticker”. However, if they missed one or more of the steps let them know what they did well and remind them of what they need to do differently next time. For example, you might say “nice job brushing your teeth and getting dressed, but don’t forget you need to put your dishes away too”. These steps would be practiced until your child was able to do it fluently. Using a chart like the one above to teach a new routine or new skills in a routine is really helpful because it provides a reference for your child to refer to in the event that they forget a step in the beginning but it also allows you as the parent to see how your child is doing. I also recommend at the beginning using the chart to provide the feedback and pairing the verbal feedback with stickers as a reward. You can do this for each of the steps in the routine or for completing the entire routine. It will depend on many factors like your child’s age, strengths and areas of need. Although I think they are really important when first teaching a new routine I also think it is important to keep in mind that there needs to be a way to fade it out. It should not be used indefinitely. 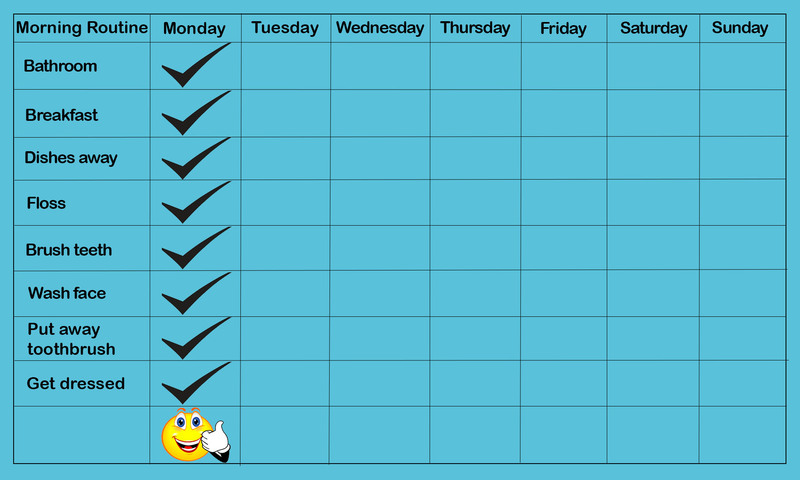 The nice thing about the chart is that you can see how your child is doing which will let you know when you can start to fade out the use of the stickers. I saved my favorite tip for last. As I mentioned earlier in the post we tend to notice the behavior we don’t want to see and this is usually because it is a necessity. I don’t know how many times I might tell my toddler “don’t play on the stairs” or “don’t put your food on the floor”. I get caught up in the moment and sometimes it might be to address a safety issue like falling down the stairs. I would never suggest that we stop noticing that, but if all you get from this post is to catch them being good I know it will make a huge difference in the quality of life in your home. It is really important to praise the behavior that we want to see more of . This is why I recommend to most of my families to start framing things in the positive way. Saying I would like my son to get dressed within 5 minutes of being asked is a good thing to notice when it happens as opposed to noticing when he is taking forever. This will help to encourage and strengthen the behavior that we want to see. Using the basic principles of human behavior and learning we can work on strengthening the behaviors we want to see and ultimately this can result in a reduction of the ones we don’t want to see. These are just a few tips and strategies that you can use to help improve the morning woes. Remember you know your child the best, so how you individualize these will depend on his or her strengths, areas of need and interests. Sarah Kupferschmidt is a Board Certified Behavior Analyst (BCBA), a Parent Coach and Professor. You can see more of her work at sarahkconsulting.com and find her on twitter at @skupferschmidt.